If you want to explore the Black Forest in Germany, but a wine tour through the French Alsace Lorraine wine region sounds just as tempting, stay in Ettlingen, and you can enjoy both. Nestled in fruit orchards within the rolling plains of the Rhine valley, this little-known gem lies only a 20-minute drive away from the Northern Black Forest in the south and a 20-minute drive to the Alsace Lorraine wine region in the west. 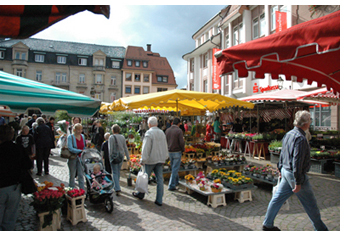 More than just the perfect hub between two countries, Ettlingen combines German and French values in a unique taste of southwestern German life. 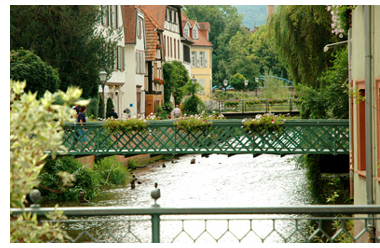 Ettlingen’s Germanic side surfaces in the town’s extensive and reliable transportation system and clean-swept cobblestone streets, and the tourism bureau’s efficiency in accommodating travelers. The local pedestrian zone bustles with small French gourmet shops, an outdoor farmer’s market, and romantic cafes and restaurants. The people of Southwest Germany take enormous pride in their hospitality. Their natural joy for life and celebration is contagious. Stop by any of the small gourmet shops––like the Markthalle––and the owners will treat you to free samples of local cheeses and meats, happy to chat with you about food, love, and life over a fresh-brewed espresso. For some summer sweetness, hit up Pierod’s for a generous scoop of gelato, and then dangle your feet in the Alb River, winding through the center of town. Ettlingen’s border town flair especially surfaces in its eclectic gastronomy, placing typical German beer gardens door to door with French gourmet restaurants. For first-class fare, check out Hartmeier’s. Or, to keep it casual, choose from one of the many restaurants around the market square. For a true German meal, visit Ettlingen’s home brewery, the Vogelbräu, and enjoy fresh rotisserie chicken, bratwurst, a real German pretzel and unfiltered Hefeweizen. Ettlingen offers a range of accommodations. The Erbprinz, an Old World style establishment, has housed a curious mix of personalities, the likes of former Soviet president Gorbatschow and Mariah Carey. Also situated in the heart of town are Hotel Engel, a more casual hotel, and many authentic bed-and-breakfast homes and holiday apartments. Once you’re settled in, head into the Black Forest for some Nordic Walking, mountain biking, horseback riding, tennis, golf, or plain relaxing in the renowned thermal spas of the region. If you take a scenic route through the Black Forest, visit the Hotel Bühlerhohe, a converted castle on a hilltop overlooking the Rhine valley. Their café restaurant serves the biggest and best Black Forest cake around. To the west, the famed Alsace wine region makes for a perfect day trip from Ettlingen. The designated wine route curves along enchanting vineyards and typical French villages, where you’ll have the chance to taste what made this region famous: a cool glass of rich, earthy Gewürztraminer with a slice of authentic Quiche Lorraine. The next day, you might go and see more of Germany, or you might return to France, or… you might just spend the day in Ettlingen—the perfect straddle between the two. For more detailed information on Ettlingen, visit the Ettlingen Tourism Office website.